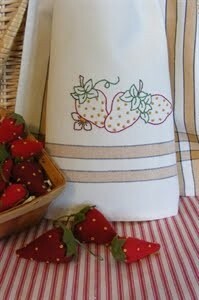 A trio of plump, ripe strawberries are embroidered on a Gold Stripe Tea Towel. 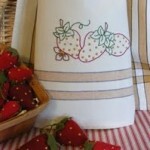 A trio of plump, ripe strawberries are embroidered on a Gold Stripe Tea Towel. Here’s another source of free designs and products for hand embroidery! Filed under embroidery, free download, patterns, strawberries |	Comments Off on A trio of plump, ripe strawberries are embroidered on a Gold Stripe Tea Towel.